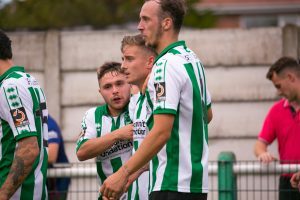 Match-winner Jarrett Rivers hailed the togetherness of the Blyth Spartans squad after securing their second victory of the season against Altrincham. Rivers’ first goal of the campaign could not have arrived at a better time as he fired Spartans into a 2-1 lead with less than 10 minutes remaining. It was all-square at the break when Sean Reid put Alun Armstrong’s men in front, though it took the visitors just a minute to equalise through Josh Hancock. Blyth, who Rivers admitted weren’t at their best, survived an unbelievable miss from substitute Tom Peers following a rare error from Peter Jameson to grind out the result and see luck go their way for a change. Rivers, who spoke soon after the full-time whistle, said: “Altrincham are a good footballing side – they played us off the park in the first-half but sometimes you just need to grind out the result and that’s what we did today. “You could see from when we went 2-1 up, the togetherness really shone through and you could see the work rate we showed at the end to see it through. “It paid off but obviously we did get a bit of luck at the end but you sometimes need that to get three points – we haven’t been getting much luck recently. Armstrong’s side haven’t had the rub of the green lately. Monday’s defeat to York City fell on a dubious penalty decision, two days after they suffered an undeserved 2-1 loss to league leaders Chorley. And had Spartans not won yesterday, their winless won would have stretched to five alongside occupying an early relegation place. “You can see from the lads’ reaction at the end how much it meant,” Rivers said. “We didn’t play our best, we improved a bit second-half but the main thing is that we got the three points. After Altrincham squandered three half-decent chances in a nervy 10-minute spell for Spartans, Rivers ‘unexpectedly’ announced himself as the match winner when his shot travelled through a load of bodies and into the roof of the net. “I need to start chipping in with a few more!” Rivers admitted. But as long as we are winning – that’s the most important thing.